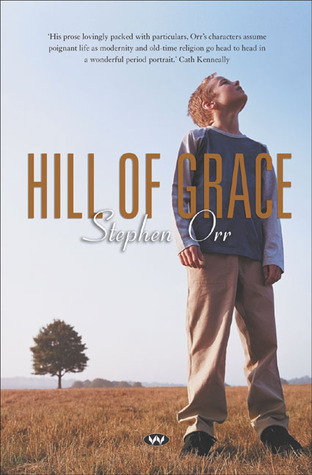 Hill of Grace, Stephen Orr’s second novel published in 2004 is destined to be one of my top ten novels for 2016. Like The Hands, (see my review) it features an irascible, rigid father in conflict with a son more open to change, but the central premise of the novel couldn’t be more different. Fundamentalist Lutheran William Miller believes that he has heard the Word of God and that he knows the date of the Apocalypse. In the small town of Tanunda in the Barossa Valley, the Lutheran community is divided and the rest of the town dismisses him as a fool. his bemused friends and neighbours, and the Lutheran community torn between Pastor Henry’s and William’s interpretation of their faith. The rich detail of the setting brings the period to life. The 1950s was the beginning of the consumer society. Bluma, working in a medieval black kitchen and suffering a constant cough because of the dust, yearns for lino. But William won’t even have electricity in the house. Bluma conceals her small acts of rebellion: she hides the instant coffee in the cellar so that she can serve it to her fellow-quilters – and on the quiet, she buys synthetic stuffing too. She sneaks out after dark to use insecticide on the vegetables, so that William can be right when he brags about not needing to use pesticides. Rose only has seven dishes in her repertoire: chow mein, stew, chops, corned beef, roast lamb, bangers and mash and on her off nights: bubble and squeak, fish and chips, baked beans. Bob, her husband, who once persuaded her to attend a cookery class, knows better now. He implores Nathan not to suggest she try anything new. Rose is also a well-intentioned volunteer at a hospital where she welcomes Terese with a friendly invitation to “Tell us about your village – Vienna, wasn’t it?” and this contrasts with the personal histories of the Lutherans being interned and German businesses being boycotted during both World Wars. Memories had to be forged, made unique, otherwise they were just somebody else’s. (p. 84). William doesn’t approve of the Drummonds, with whom Nathan boards, but Nathan, watching Bob negotiate his son Phil’s late adolescence, marvels at the novelty of a father sparring with his son. In his Tanunda home, William’s word is law. And as March 21st 1952 creeps closer, the Lutheran community gradually rejects William’s tests of faith. There are some droll scenes involving local children in dramatic representations of the forthcoming doom, and William himself fails to see the irony in using a printing press to inflict endless brochures about his prophecy on his community. The Elders meet in dismay and irritation, and he tries another church but is told that a churches are families, and that if you’re not happy with the one you’ve got, you won’t be happy with another. This is the dilemma facing Nathan, because he is happier in another family. Hill of Grace is a deeply satisfying novel. The large cast of characters and the frequent scene-switching requires the reader to pay attention but it mirrors the way Nathan makes sense of his experiences, piecing them together bit-by-bit. But it’s more than a coming-of-age novel; it’s also a deft portrait of a community coming to grips with post-war social change, and it depicts the depth of feeling and belief that motivates people of fundamentalist faith. See also the Combined Reviews at Matilda. this one, Hill of Grace (2004). PS (Uncharacteristically for Wakefield Press), the cover design by Liz Nicholson, designBITE, seems inappropriate for this book. I’m open to being corrected but I think it’s anachronistic. In my memories of the 1950s, teenage boys did not wear tops like that i.e. a collarless, long-sleeved, and oversized pullover; they wore buttoned shirts at school, at home and at work. Wealthy, fashion conscious young men might have had polo shirts for casual wear because Lacoste began to market them in colours other than white in the 1950s but they were expensive (and William Miller wouldn’t have allowed his son to have one). In the 1960s US universities began advertising their names on sweatshirts like the one on the cover but they were not available for general wear until the 1970s. Not only that, Orr makes a point of the Miller household being dressed in dowdy, out-of-date clothing because William insists on using what they have, including his own father’s suits. (See Fashion History and the History of the Polo Shirt or just Google images for ‘children’s clothes in the 1950s’). Oooh, that is very tempting! I did like The Hands. Great review! I think I liked this one even more than The Hands – perhaps because the community he depicts is so foreign to me? I mean, I’ve been to the Barossa plenty of times, but never encountered the Lutheran community the way it’s depicted here. I remember clothes in the 1950s, lots of greys and browns, handknits and hand me downs. And Rose’s cooking a lot like my mum’s. Big German community in South Aust and through to north western Victoria, dating from the nineteenth century. Yes, that’s how I remember it too. Girls had brightly coloured cotton dresses in summer but more sober colours in winter because wool and serge weren’t washable and dry-cleaning was expensive. But boys wore greys and browns, with maybe a bit of colour in the hand-knits they wore: cable-knits and fair-isle if mum was a good knitter, plain stocking stitch if not. Sometimes they had a jacket/blazer that they wore over the top of a knitted sleeveless jumper. And yes, hand-me-downs because clothes were well-made and long-lasting and people were still thrifty after the war years and rationing. I really liked The Hands, so I’d like to read another one by him. Re-clothes: didn’t boys wear short pants too? I think so, that is (from memory) they wore short pants until they started secondary school in Form 1.. This may have been a hangover from WW2 rationing in Britain when, to save material, boys were only allowed to have short pants, and the ‘tradition’ remained after the war. Australian schools were modelled on British ones and followed the same dress code. (I wasn’t actually here in Australia in the 1950s, I didn’t arrive till the 1960s). You’re spot on Lisa. I didn’t wear long’ns until I started high school in 1963. Then a few years later in senior high the head tried to stop us wearing shorts in summer, remember knee length shorts and long socks! Yes, a very stylish look. Not.